Taco Bell's new Breakfast Quesalupa is the morning version of their much-heralded, new menu item. Some of you might remembered that I mentioned there was also going to be a breakfast version back in January. It consists of bacon or sausage plus eggs, crispy potatoes, nacho cheese sauce, and shredded cheddar cheese on a Chalupa-like shell stuffed with melted pepper jack cheese. The suggested price for the Breakfast Quesalupa is the same as the regular Quesalupa at $2.99. It's also available with a drink (a medium Freeze, fountain drink, or coffee) for $1 more. 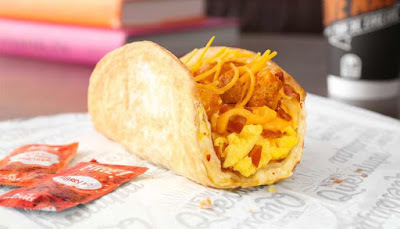 Taco Bell doesn't do all day breakfast (yet) so you can only get the Breakfast Quesalupa from 7 AM to 11 AM (breakfast hours may vary).